Are you on track for retirement? Click on the image to find out. Dutifully socking away a chunk of your salary each month may seem like a surefire path to a comfortable retirement. But there are plenty of ways you could be sabotaging that savings. Here are five common pitfalls to watch out for. 1. Saving on autopilot: These days, many employers are automatically enrolling workers into the company 401(k) plan. While that has helped boost participation rates, it has also given some employees a false sense that they are saving enough. Auto-savings rates typically start at just 3% and generally reach 6% of annual pay. While it's a good start, financial planners say you should aim to sock away 10% to 15% of your salary each year. Many employees, however, never boost the amount they are stashing away. It is a "huge mistake that many savers make," said Chip Castille, head of BlackRock's U.S. retirement group. "They mistakenly believe that they're getting some kind of implied advice as to what the appropriate level of savings is," he said. 2. Leaving money on the table: If someone offered you free money, you would take it right? Yet many savers don't take full advantage of their employer match, often because they don't know how it works or how much they can get. Share your story: What's your biggest retirement mistake? "The confusing thing is that every company does something different," said Minneapolis-based financial planner Sophia Bera. For example, some companies match their employees dollar-for-dollar up to a certain limit, while others match only 50% of contributions but up to a higher level. Missing out on those dollars can really add up: an extra $1,000 each year can boost your nest egg by tens of thousands of dollars over several decades of saving. Ask your human resources department to explain their matching policy and try to take full advantage. 3. Paying high fees: Studies have shown that retirement savers can lose more than $100,000 to fees and lost returns, yet many savers pay little attention to what they're paying. "If you don't know how much you are paying, you are already paying too much," said Yoav Zurel, chief executive officer of FeeX, a free service that helps people reduce the fees they're paying. Related: How much are 401(k) fees costs you? To figure it out, look at the expense ratio of the investments in your 401(k) or IRA. This is the annual percentage of your account balance that goes toward investment management fees and other costs associated with operating the funds. Actively-managed funds tend to carry higher expense ratios, for example. Instead, consider investing in index funds, which mirror overall market movements and usually carry cheaper fees of below 1%. Another thing to watch out for: While employer-sponsored 401(k) plans often absorb administrative costs, or roll them into the expense ratios, IRAs usually come with additional fees to cover those expenses. 4. Retiring too early: It may be tempting to retire as soon as you can. Who doesn't want to escape the daily grind? But if you're in good health, holding off just a few years can make a big difference. Take Social Security, for example. You can't qualify for all of your earned benefits until you reach "full retirement age," which is 66 for most Baby Boomers and 67 for those born in 1960 or later. That means that checks you claim at age 62 will be around 25% smaller than at your full retirement age. And if you wait even longer, your annual benefits will grow by 8% for each year you wait up to age 70. 5. Wishful thinking: Simply hoping that your nest egg will be big enough to support you in retirement won't cut it. Yet few people take the time to set out a realistic savings plan, said Rande Spiegelman, vice president of financial planning at Charles Schwab. When crafting your retirement plan, think about the lifestyle you'll want and how much you'll have to save each year to meet that goal, he said. 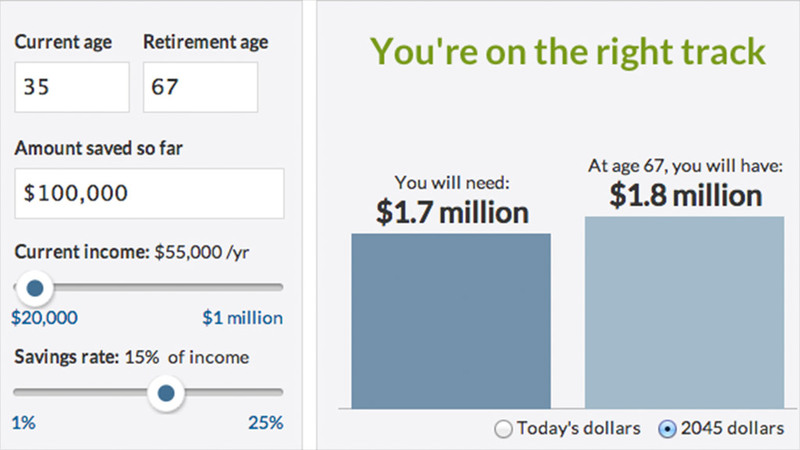 Try using an online retirement calculator to get started. Most retirement providers also offer online tools to help you plan. "Ignorance is not bliss here," he said. "Wishful thinking is dangerous." Have you made a retirement-related mistake? Email melanie.hicken@turner.com to share your story.